A kingdom that has ambitions of turning itself into an empire has the obligation of pumping oxygen into its offense than splurging the resources to strengthen its defense. Indian cricket, now, is at an important juncture. They have two ways ahead of them. Firstly, that they are very much used to and would do no harm to their hegemony in the subcontinent if they decide to travel through it, which will take them to places that they have already been to. Secondly, that is replete with fresh challenges and perilous scenarios but would take them to the helm of world cricket which they have been gravitating for a very long time, satiating their megalomania. Dominating the world of Test cricket is akin to expanding your kingdom. Unlike in the shorter formats where teams have two resources – wickets and overs; in Test cricket, teams have only a single resource – wickets. Hence, a bowling team cannot expect to win Test matches by controlling the pace at which the runs are scored as in the shorter formats. To win Tests, you should be able to pick up all the 10 wickets in both innings. So, India has to decide whether they want to strengthen their defense by solidifying their limited stronghold in world cricket by persisting with strengthening their batting, or whether they want to breathe menace into their offense by pampering their bowling options to capture new territories. They can either consolidate their current position or take a huge risk to expand their boundaries in world cricket. In the lone Test against Bangladesh, India adopted the strategy of playing 5 specialist bowlers. Even though critics have been forthcoming about India’s need to play an extra bowler to stand a chance of picking up all 20 wickets, former Test captain MS Dhoni persisted with his 4-bowler strategy. In the Test series against England last year, Dhoni promulgated a proxy 5-bowler strategy by playing a seam bowling all-rounder at the number 7 spot in the form of Stuart Binny. This is the first time after several years, however, that India went all out with 5 specialist bowlers. Should they continue with this strategy of trying to take the game to the opposition? Or should they worry about their ailing batting lineup in alien conditions? Or do they need to search for a genuine all-round option? To begin with, India has averaged 40.5 with the bat in Tests at home during the last 5 years while the bowlers have averaged 29.14 per wicket. In 14 of the 20 games, they have managed to pick up all 20 wickets of the opposition, with spinners playing a pivotal role. Even in the game against Bangladesh, the two specialist spinners for India, Ravichandran Ashwin and Harbhajan Singh, bowled 42.5 overs between them out of the total 65.5 overs. What can be inferred from this is that India have done well at home with both bat and ball even when they have played only 4 specialist bowlers. So, the strategy of playing 5 bowlers would have minimum effect in the outcome of the game. The numbers, however, provide a stark contrast away from the sub-continent with the Indian bowlers managing to pick up all 20 wickets only in 9 of the 31 Tests in the last 5 years. The average of the bowlers is also scornfully high with every wicket falling for 45.12 runs. The batting has hit rock bottom too with an average of 28.91. To put it simply, India’s performance overseas has been diametrically opposite to their performance at home. Should they strengthen their batting by playing a specialist at No.6 (with the wicketkeeper batting at No.7) or should they play another specialist bowler to give more options with the ball? As Virat Kohli said in an interview recently, all you need is for three of the top seven to click to put up a hefty score on the board. If the top order fails then the specialist batsman at No.6 can seldom do anything to prop up the batting. Moreover, even with 7 specialist batsmen (including the wicketkeeper) in the side, their performances with the bat away from home in recent times have been far from satisfactory. So, it can be argued that India can play a bowler at the number 7 position instead of playing an extra batsman, who more often than not is not going to help them revive their batting fortunes. On the flip side, a feasible argument could be that India should play a more competent specialist batsman who is capable of scoring runs overseas at No.6. However, if the top order is going to flounder, whether the extra specialist batsman can add another 100-150 runs batting with the tail is a question that needs to be answered. Another parameter to look into is whether by strengthening their batting, they are really going to start winning Test matches away from home. As mentioned at the start of this article, this will only help them avoid defeats and draw games. Would Kohli settle for anything less than a victory? The answer is a definite no, as illustrated by the fact that the robust skipper pushed for a victory in Adelaide last year when defeat seemed inevitable. He is wise to the fact that one needs to risk losing a Test match to win it as the ability to achieve dominance in any sport comes from the quality of being fearless and aggressive. The safety-first approach has hindered India’s progress in Tests and trying a new strategy is not going to hurt them much as the team has already not tasted much success in Tests outside their abode. I would rather lose trying a new strategy than losing with the strategy that will land you no further than the territory of defeat. Besides, playing Ashwin at No.7 does not really weaken your batting. In the last 5 years, batsmen at No.7 have scored at an average of 30.19 while Indian batsmen at number 7 have garnered runs at an average of 26.49. Ashwin, in the meantime, boasts of a Test average of 36.03, with only Sarfraz Ahmed, Matt Prior, BJ Watling and Nasir Hossain having an average higher than that of Ashwin at number 7. Dhoni, who batted at No.7 for the majority of his Test career, had an average of 26.79 at No.7 in the last 5 years. Ravindra Jadeja, the only other batsman who has played a substantial amount of matches at No.7, averages just 15.20. In 25 Test matches, Ashwin has scored two centuries and four half-centuries and shown the capability to handle himself across all conditions, as illustrated by the fact that the gangly off-spinner has a batting average of 43.35 in India, 35.33 in England and 27.60 in Australia. He has also scored runs at a fairly healthy strike rate of 62.43, which is an important trait for a No.7 batsman. If Ashwin is promoted to No.7 in the order, it will obviously mean that Wriddhiman Saha will have to bat at No.6. Saha has batted in the top order for his IPL franchise and scored the only century in an IPL final in the 2014 season. He bats at No.5 for West Bengal in the Ranji Trophy and earlier this year faced 232 deliveries to save a match for his team. So, his skills as a batsman are unquestionable but whether or not he can do the same for India is a question that can only be answered with time. Even if Saha fails, India have quite a few options up their sleeve when it comes to wicket-keeping batsmen. Last year, Naman Ojha scored a double ton in Australia for India A when they were in deep trouble, and the extremely talented Sanju Samson is eagerly awaiting his opportunity. Hence, India should have no qualms about playing a wicketkeeper at No.6. Moreover, by playing 5 specialist bowlers India can avoid the problem of fast bowlers breaking down due to fatigue. While the Indian bowlers have shown some positive signs in the last one year, they have not managed to sustain their form due to the amount of workload they have had. This way, the captain would be able to manage his resources more judiciously and all bowlers would get the required rest to remain potent throughout the course of a Test match. India are also in need of fresh tactics that can help them turn around their fortunes in the longer format since whatever they have tried in recent times has failed to come off. India played Ravindra Jadeja at No.7 as a spin bowling all-rounder in the home series against Australia in 2013. Even though Jadeja was extremely impressive with the ball, he failed miserably with the bat. Then, Jadeja played as a specialist spinner in the 2nd Test against South Africa at Durban in place of Ashwin. Although he managed to pick up 6 wickets, he could not have much impact as South Africa amassed more than 500 runs in their only innings. In the following Test series against New Zealand Jadeja failed both as a batsman and as a bowler. In the Test series in England, then, India deployed Stuart Binny at No.8 and Jadeja played as the specialist spinner at No.7. Despite playing as an all-rounder in conditions which were tailor-made for his style of bowling, he bowled only 10 overs in the first Test. 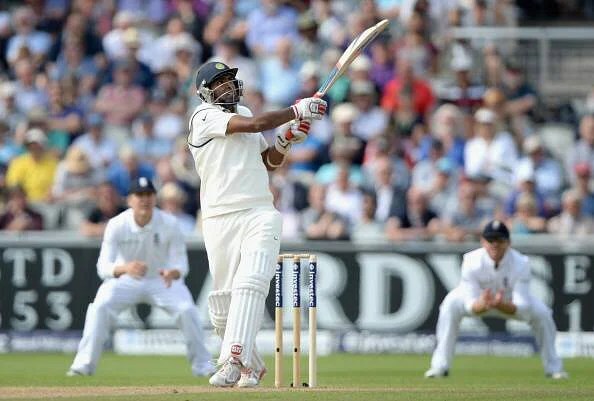 But with the bat, Binny scored 78 in the second innings as Jadeja went wicketless in the match. In the third Test, India jettisoned Stuart Binny and played 7 specialist batsmen and axed one of the specialist batsmen to accommodate Ashwin. In the fifth Test, Binny once again came into the team with Jadeja being the one dropped. One common observation that can be made from this is that India have attempted in vain to find an all-rounder to fill the vacancy at number 7. Both Binny and Jadeja are jacks of all trades but masters at none. By Test cricket standards, they can neither be considered genuine bowlers nor genuine batsmen. What India needed and needs is a specialist at the spot, and it must be a bowler since playing a batsman there has already flunked them. Most teams have an all-rounder within their batting ranks who can pitch in with the ball. Australia have Shane Watson while England have the services of both Ben Stokes and Moeen Ali. Bangladesh and New Zealand have Shakib Al Hasan and Corey Anderson respectively. It is a luxury that India are not blessed with. Instead of trying to pull all the stops to find a genuine all-rounder, India should concentrate on maximising the resources at their disposal. Ashwin is an exceptional spin bowler and has also contributed more adeptly with the bat than the all-rounders that India have tried hitherto. Turning the pages of history, you will find that playing an extra bowler has helped teams achieve miracles. During West Indies’ famous 5-0 whitewash of England in 1984, the West Indians played 5 specialist bowlers – Malcom Marshall, Joel Garner, Roger Harper, Winston Davis and Eldine Baptiste – throughout the series. It was their menacing bowling that won them the series, but the lower order still contributed to the batting as they helped the West Indies accumulate big scores. India’s first overseas Test win came in 1967 when they played 6 specialist bowlers. While Erapalli Prasanna, Bishan Bedi, Bapu Nadkarni and Ramakant Desai constituted the catalogue of specialist bowlers, they were helped by the fact that Rusi Surti and Syed Abid Ali, who were able bowlers, batted up the order. India’s first win in England also came when they played 5 specialist bowlers – Eknath Solkar, Abid Ali, Bishan Bedi, Srinivas Venkataraghavan and Bhagwath Chandrasekhar. It is perplexing how a team like India, who are blessed with a plethora of talent, can underachieve like they have in Test cricket in recent times. The fault does not entirely lie with the players or the system. It is the attitude that has put them into the burrow they are in. Despite winning the World Cup, the Champions Trophy and the World T20 and becoming the No.1 Test team in the world within a space of 8 years, India are not the dominant team that their talent ought them to be. The fault, as mentioned above, is in the attitude. Negative emotions will triumph anything that is positive. The moment you start thinking of defeats, victory will drift away from you. Being overcautious has been India’s undoing in the recent past. Is India going to take that leap of faith and continue with the 5-bowler strategy? Or meander inside the same maze which they have been unable to come out of for ages? If Kohli is to realise his aim of making India one of the most dominant sides in the world, there is only one way forward. After all, India are one of the powerhouses in world cricket and should stop behaving like those wimpy kids who look up at the heavens for intervention, when last-minute exam preparation disowns them and should instead act like those brave dudes who enhance what is at their disposal to emerge victorious. Next story Who is the greatest match-winner in Tests among current batsmen? Previous story Who is the greatest match winner in ODIs among current batsmen?